Susie we have not hit below 35 yet so no killing frost and no freeze. I am in shock as the roses still bloom here. I am loving the pansy vase and love the salvia with the white mums. I need to find some bargain dahlias as I cannot overwinter them and I pay too much for them to never bloom or die every year. Wonderful vases and I love the shot of the meditation garden…just beautiful! Thanks Donna. I just went outside and walked the meditation path (with a few stops to pull up weeds). It’s been a nice, long autumn, hasn’t it? The Portmerion botanic vase is another wonderful gift from my sisters. I’m glad the frost didn’t damage your garden Susie. The chrysanthemums are lovely, I am just discovering what a good cut flower they are; the red dahlia is a great colour and as you say good value. Dahlias usually die right back at the first frost but you can lift the tubers or mulch heavily and leave them in the ground if your winter isn’t too severe. I think you’ll enjoy your beautiful chrysanthemums. The one I showed today was given to me by my mother’s cousin–she passed along many plant to me through the years. I’ve probably grown this chrysanthemum over 25 years. 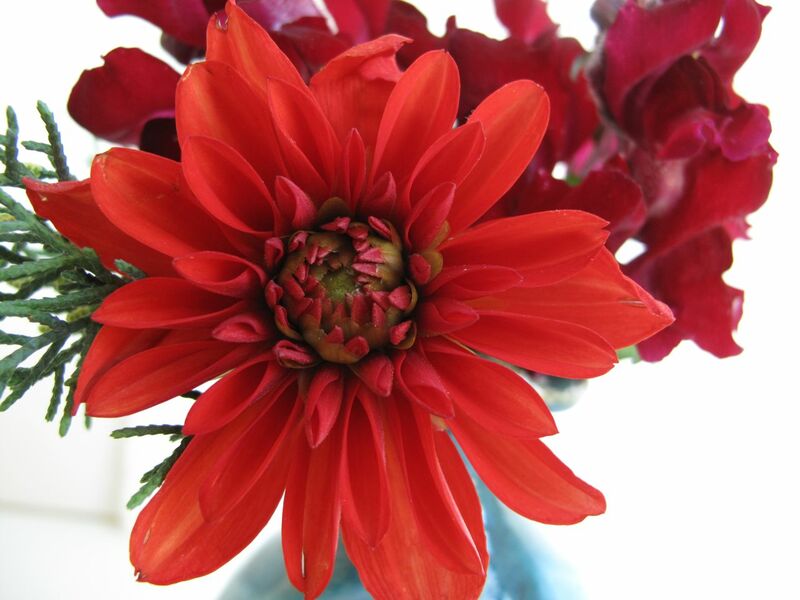 The red dahlia and snapdragons are very striking but I am crazy about that little Chrysanthemum. What a little darling it is. Up to a couple of years ago I didn’ t like chrysanthemums. I can’ t think why not, I love them now. There is nothing to beat them in November. 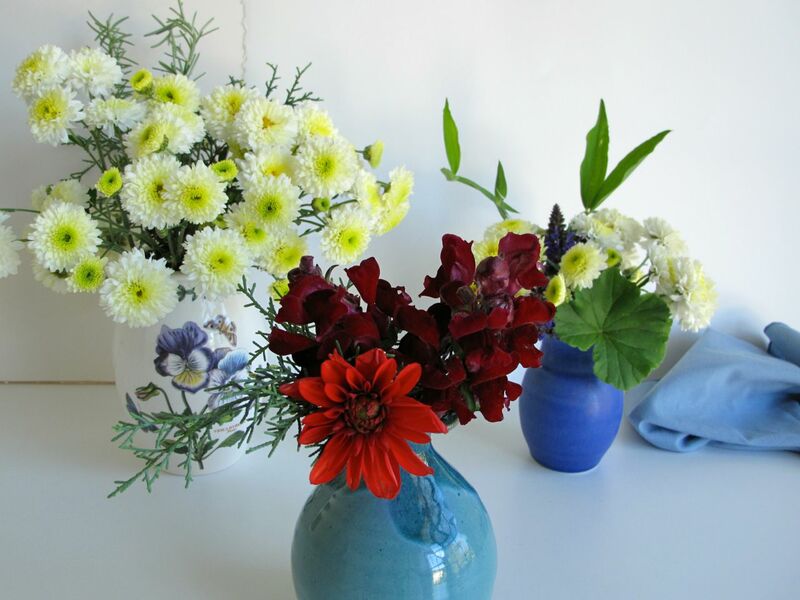 Chrysanthemums are ubiquitous around here, often sold as potted plants in autumn, but they have their place. The one I used today was a passalong from a special person and has been thriving for a couple dozen years or more. 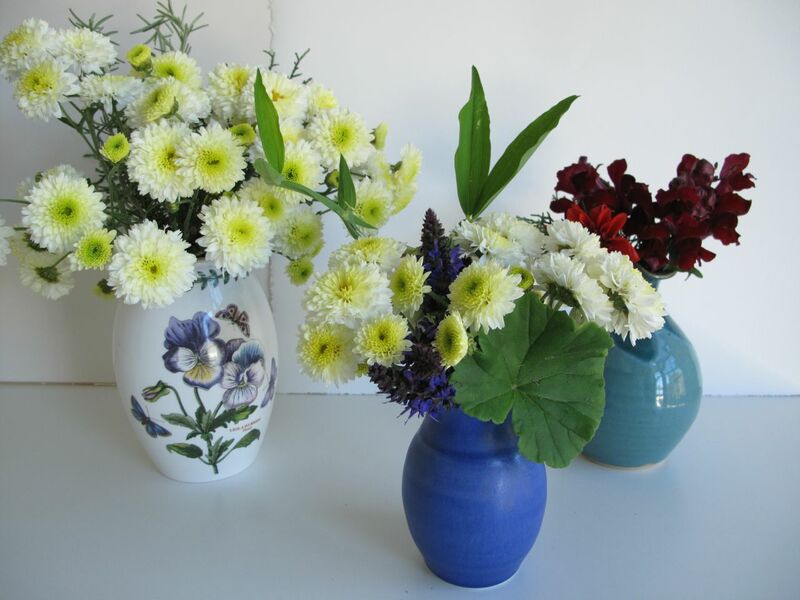 Your flowers are really fresh and enticing Susie, I love the colour combinations and the vases are very pretty, I like the idea of a trio too, they all look very well matched. We have had a large dip in temperatures here and fear a frost is not far away. Thanks Julie. I enjoy putting together a mix of flowers. This started today as a pair of vases but I hated not to use the extra chrysanthemums I’d brought indoors. Hope you get a bit longer before frost. I love your red dahlia, very velvety. My snapdragons are, well, interesting, I must find a way to use them, but I won’t grow them again, they are distinctly odd, unlike your very classy ones! Thanks Janet. I felt so lucky to come upon the dahlia and snapdragons at a drastic closeout sale. Sorry you’re not happy about your snapdragons. I’ve not grown them much and this is the only kind I ever see around here. 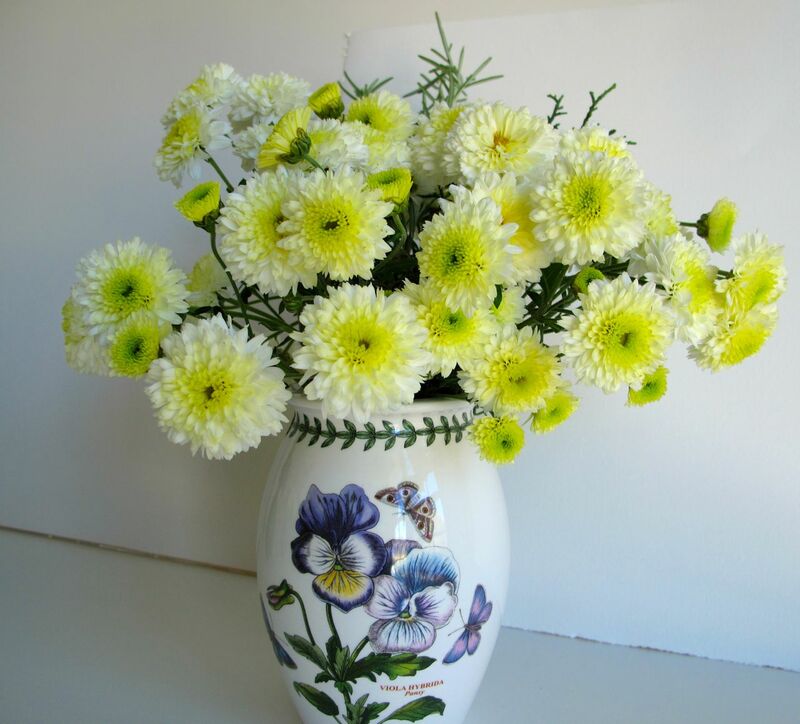 Your chrysanthemums are very pretty Susie, and I love your arrangements with the foliage added to them. We haven’t had a frost yet so I’m surprised you got one already. Hope it gets a bit milder again for you now. Thanks Cathy, I think we survived without any frost damage and now will have a reprieve. Winter is sure to set in one of these days though. Seems like you’ve had a pretty nice autumn too. Hope November is good to you. 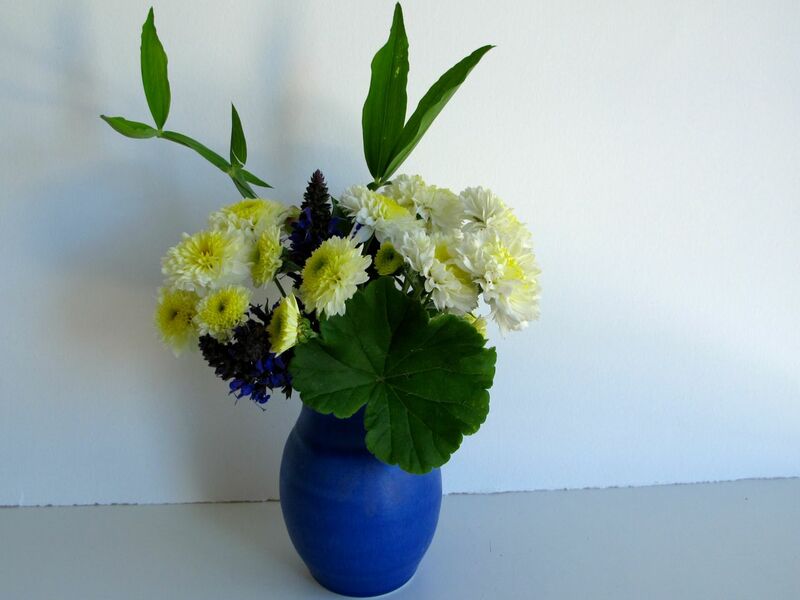 Yes, the dinky little chrysanths are becoming more tempting, like Chloris says….I can see me wavering…..! What great bargains you have had this year, Susie – always nice to have these and things passed on from friends too. These little vases bring just as much pleasure as anything bigger, don’t they? I often pop a little one with leftover trimmings in the bathroom these days. Thanks for sharing , as always. Chrysanthemums are not exotic but they’re welcome nonetheless at this time of year. I do hold this particular one close as my garden mentor shared it with me so many years ago. And yes, small vases are quite fun and useful. Judy, thanks so much! I’m hanging on to these last precious bits from the garden. I love your use of three vases. Most attractive arrangements. Thanks John. These vases never turn out as I originally envision. Once I gathered the flowers I just kept reaching for another container. You have the most beautiful vases, Susie. 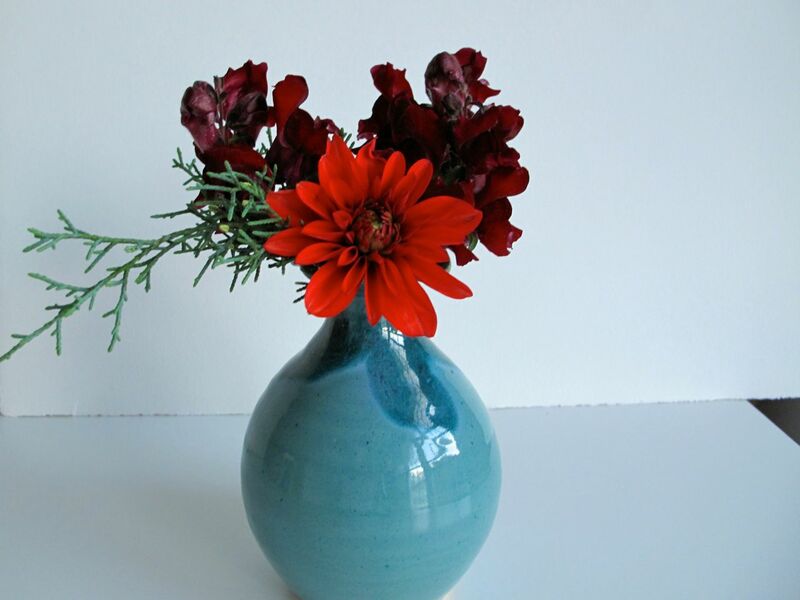 I love all of them but the first Chrysanthemum vase is my favorite. But I was most impressed to hear of the 25 cent snapdragons – what a bargain! I’ve been turning a blind eye to those arriving in the local nurseries the past couple of weeks as they become coated with rust almost instantly here but, at that price, I’d grab up a bunch. Thanks Kris. I’m fond of that chrysanthemum vase too. The snapdragons were a lucky find at a big box store that was having a closeout sale. It really was a few weeks past when the plants should go into the ground. Don’t know about rust getting on them–will have to watch for that. I really enjoyed all three of your vases, Susie – (and the vases themselves were lovely, I must try harder and look around to add to my collection – keep breaking them, but you’ve inspired me). That chrysanthemum really is so sweet – and it’s lovely to have plants in the garden that friends or relations have given you, isn’t it? I’m now looking at chrysanths with a new eye after your post, as both Chloris and Cathy have commented. Thanks Cathy. I liked the vase you chose for your roses, but it’s always fun to discover another one. So many of the plants in my garden have a connection to someone who shared the plant with me. If someone hadn’t given this chrysanthemum I doubt I’d have added one here, but am glad to have it this time of year. These arrangements looks ultra professional! Dahlias are a huge favorite of mine and the chrsanthemums are so cheery! Thanks so much! I’ve become a fan of dahlias this year too. Hi Susie: Oh, what gorgeous arrangements. 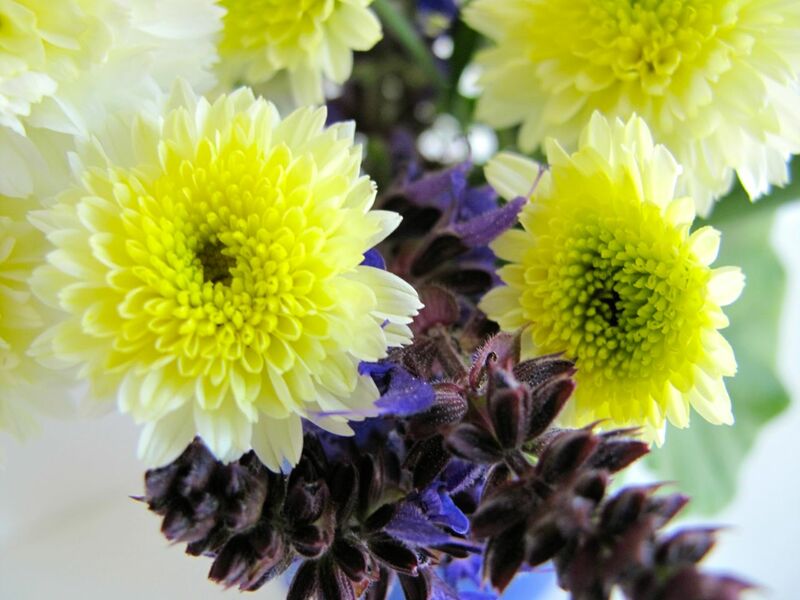 Your color combinations are really stunning: that yellow chrysanthemum with the dark Salvia is beautiful!! Loving your snaps: my yellow ones have finally started to flower, so I even covered them with a sheet the other night. Let’s hope this warm weather continues for a while. And thanks for the shout-out! Thank you Libby. Hope your snapdragons get a nice long bloom time. I covered my azaleas one spring at my old house and swore off ever doing it again–too much extra laundry. I love snapdragons, especially that color. I always mean to get some and always forget. My grandfather grew them and since he lived in Indiana was able to grow them all summer. The snapdragons were a real bargain and I was pleased to find the red. Haven’t tried to overwinter them but hope they’ll do ok and bloom again in spring. Nice memory of your grandfather. Thanks. 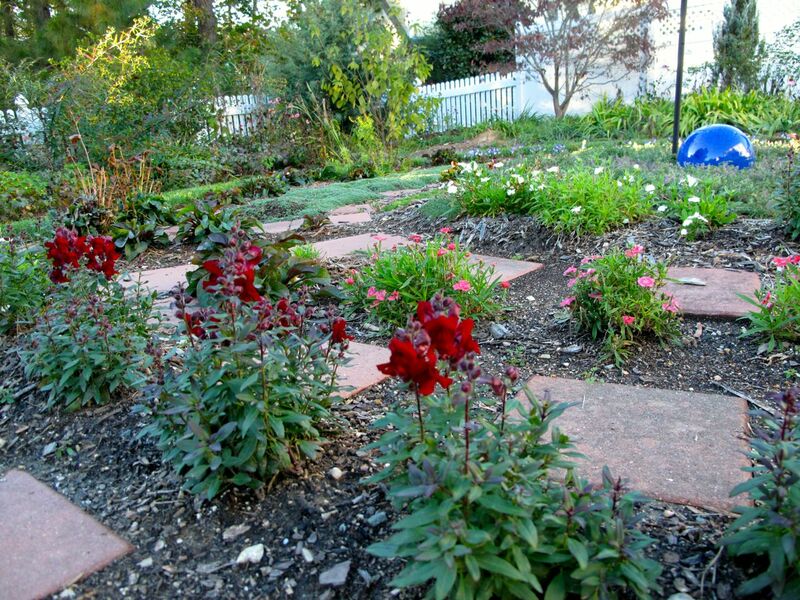 We’ve had a nice slow fall and the garden responded nicely to the moderate temperature. Since that picture was taken we’ve have a couple more frosts and things are decidedly more brown, but there are a few bright spots.